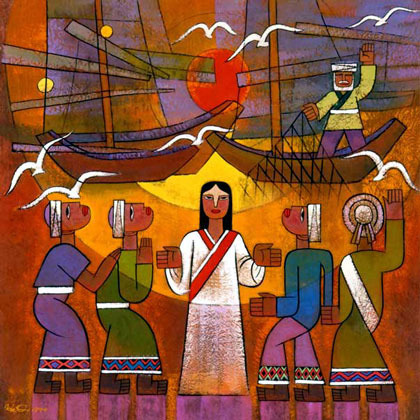 Calling Disciples, by He Qi. Well whanau, I must have annoyed whoever puts our Ministry Team Roster together, because, as if preaching last week, the first Sunday in Ordinary time wasn’t hard enough, I have been put down again to preach this Sunday. Although it may seem like that is rather bad luck, I don’t think it is. The themes that were started last week continue this week and allow us another opportunity to reflect on what we are being called to do as we enter the year proper. Last Sunday we celebrated the Baptism of Jesus and this week we follow on from that in the natural progression from baptism, to putting those baptismal obligations we spoke about last week, into action. During the season of Epiphany the themes we celebrate revolve around Jesus revealing himself to us and this week is no different. Here, this week with the calling of Phillip and Nathaniel we experience the revelation of Jesus in Galilee, a revelation that is revealed to us in his calling of Nathaniel. According to Peter Woods, the imagery of the fig tree here in John points to the Old Testament idea of the Fig Tree being a place of blessing and comfort. On the other hand the fig tree in the New Testament is most often seen as a cursed place, an image of a withered fig tree is what we are given in Mark, chapter 11 . Although these two interpretations seem to be miles apart, and on different ends of the scale, it is this space that Nathaniel is occupying in this reading, and it is the place that we risk occupying too if we let ourselves slip into the “ordinary” this Ordinary Time. This coming week marks a return for a lot of people. If they haven’t already, most people will be returning to work this week and although there is a few more weeks before uni and school starts back, book shops and malls are already starting their “Back to School” sales. Before we know it we will be lost in another year of School, work, and other priorities. It won’t be too long before we are all caught up in our own lives and our own issues, but one thing we must remember, even though thoughts of Christmas may be fast becoming a distant memory, is that we must take forward with us, into the year and the ordinary time, the spirit of Christmas and the Good News of the birth of Jesus Christ. As Christians, wherever we go, and whatever we do, we carry with us the essence of our faith, the belief in Jesus Christ. This means, whether we like it or not, we are symbols of our faith and for Christ wherever we are. This responsibility calls us to live out our faith at all times. Not just at Christmas time or during Lent when we might be a little more conscious of our faith, but in all places and at all times. This calling to live out our faith is even more important during the normal, mundane times of our lives, and this time of the year is a good time to be reminded of that. Before the hustle and bustle of the year kicks in and we are truly overwhelmed by the pressures of life it is important to stop and reflect on our faith and what our faith calls us to do, before the year grabs a hold of us and before we know it, it is Christmas time once again and we have lost another year. Every interaction, every moment is an opportunity to live out our faith. That doesn’t mean that we should be standing on a street corner preaching or we should be actively trying to convert our friends, but rather that we should live our lives informed by our faith in Christ and become a walking, living testament to that faith. As St. Francis of Assisi put it, we are called to preach the gospel at all times, and only if necessary, use words. Since October here in New Zealand, and all over the world there has been a group of people living out a type of faith. Since last year a movement called Occupy have been responding to what they perceive to be an injustice. The basic thrust behind the movement is an attempt to name and increase awareness about the inequality around the distribution of wealth and political power. Their main slogan is “We are the 99%.” This is reflective of the fact that 80% of the World’s wealth and power rests with a mere 1% of the population. The people involved in Occupy are responding to their beliefs, and their actions are being informed by those beliefs moving them to express their concern through various occupations throughout New Zealand and the world. Currently the movement in Auckland has occupations at Aotea Square, Queen Street, Albert Park and Victoria Park. Now, whether or not you support the movement, or think what they are doing is the best way of going about raising awareness, we cannot deny that this movement is at least doing something. Just like the people of the Occupy movement we need to let our beliefs and our faith inform our action. Of course, this doesn’t mean we all need to go and pitch tents outside Holy Trinity Cathedral, but rather that we need to be ready to step out in faith because of our beliefs. We need to be ready to leave the comfort and shade of our own fig trees in an attempt to effect change. To do this though we need to be constantly aware of our faith and the obligations that comes with being followers of Christ. This means not taking a place at the banquet table if our brother or sister is denied one, it means being ready to deny ourselves for the greater good, it means we need to preach the gospel, not with words but with actions. Only when we, like Nathaniel leave our own fig trees can we truly effect change and whole heartedly live out our own calling in Christ to love and to serve. If we don’t we risk turning our fig trees into withered, cursed places of selfishness and greed, instead of life giving places of strength and foundation. 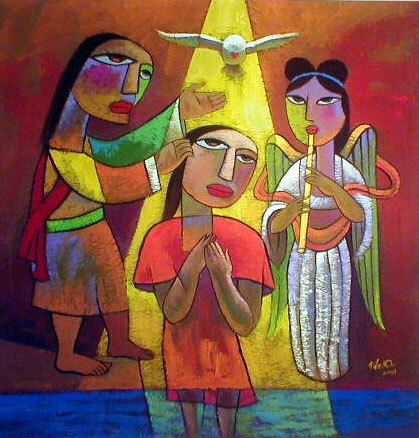 The Baptism of Jesus, by He Qi. Christmas is a time of year where, more than any other time, the difference between the rich and the poor is made obvious. It is at this time of year when the struggles of those on the lower end of the Socio-economic scale become front page news and for this one time of the year, the spirit of Christmas calls us all to respond to this poverty that is all around us. Here and now, on this, the first Sunday in Ordinary time, it is good to be reminded that poverty doesn’t just affect people during Christmas but also on the other 364 days of the year. The Herald reported that this year’s turn out to the Auckland City Mission’s Christmas lunch was an all time high, and so many people turned up that some had to be turned away. It is now, after the struggles of the poorest of our community is no longer making it to the front page of our news papers that we should be responding to our calling to love and to serve. A calling that is inside every one of us that claim to be followers of Christ, a calling that is instilled in us at our baptism and nurtured for the rest of our lives. Baptism, it is something that we do quite often here at Te Karaiti and in a couple of weeks we will be doing it all again as we welcome the Chanel and Tui who will be bringing their Children to be baptised. What a beautiful thing, a young newly married couple living out their faith in such a way that causes them to realise the promise, the potential and the hope that is signified in baptism. For Chanel, Tui and their whanau it will no doubt be an emotional time. Memories of past baptisms will come to mind…thoughts will turn to loved ones who couldn’t make it and still others who are no longer here. But the overwhelming feeling on the day will be one of joy. This morning, although there will be no baptisms, we celebrate and remember all those things that baptisms mean; promise, hope, and potential…in the Baptism of Jesus. The gospel of Mark does not to have a Nativity Narrative, that is, there is no account of the birth of Jesus, instead we are taken directly to Jesus’ baptism. Jesus’ seeking and acceptance of baptism is a sign of unity with and an example for us to follow. Although the baptism being offered by John was one of repentance, Jesus’ sinless nature meant that there was no sin needing to be repented, but rather the necessity for baptism and the importance of baptism was as a starting point, and an opportunity for a new beginning. For many, the baptism of Jesus signifies the beginning of his ministry, a new phase in his life. At this time of year and on a day in which we remember the Baptism of Jesus we are given an opportunity to reflect on the past year and think about our own new beginnings and the promise, hope and potential that the New Year brings. When we think of the bible and the theme of New Beginnings we most often call to mind the creation story in Genesis, but the bible is full of New Beginnings and this, the baptism of Jesus is an example of just that. Here, today, we are given an opportunity to once again stop and reflect. First of all on the past year, the good times, the bad, the successes, the failures, the ups and the downs. But it is also an opportunity for us to look to the future, the New Year and see where our baptismal obligations are leading us, and what those obligations are calling us to do.